What will an Athletic Scholarship Pay for? While your goal here is to pay for college, unfortunately, athletic scholarships typically are not as generous as regular financial aid or merit awards that your student athlete might be able to pick up from other schools. Only four NCAA Division I sports guarantee full-ride scholarships: football, men's and women's basketball, and women's volleyball. In these four sports, a student either gets a full scholarship or none at all. In all the other sports, partial scholarships are commonplace. So, while you are pursuing athletic money, you should also be looking for schools that can offer academic awards or need-based financial aid. Are Grades Important for Scholarship Athletes? College coaches look to recruit well-rounded athletes who excel both on and off the field. If you want to play for an NCAA Division I or Division II school, you must have a 2.0 GPA (or better) in your core courses. Standardized test (SAT and ACT) scores, combined with your high school grades, are used to predict your academic success in college. Enrolling in Advanced Placement (AP) courses, which take an in-depth look at a subject, show your dedication to challenging yourself in high school and allow college freshmen to test out of or get college credit for the course. Extracurricular activities and volunteer work shows that you are responsible enough to handle the pressures of school and your sport, while still taking part in other activities. There are some great programs that can help you study and raise your SAT and ACT standardized test scores. Some even offer need-based financial assistance. Your personal MVP Recruiting Coach can help identify good programs in your area to meet your needs. What are the NCAA Eligibility Requirements? The NCAA publishes a handy eligibility guide for all college-bound student athletes (download your copy here). Amateurism certification ensures that NCAA regulations are applied uniformly for incoming student-athletes. The amateur certification process starts when college-bound Divisions I and Division II student-athletes register with the NCAA Eligibility Center (www.eligibilitycenter.org) at the beginning of their junior year in high school. NCAA Division III amateur certification is completed individually by each college or university. NCAA Academic eligibility requirements are detailed in the Quick Reference Sheet. NCAA recruiting rules must be followed to ensure compliance with NCAA eligibility. You can review the rules and sport-specific recruiting calendar for your sport here: NCAA Recruiting Calendars. Your personal MVP Recruiting Coach will be happy to walk you through all the necessary steps for registration and compliance. Sure you want to play in college, but remember that playing sports is, first and foremost, a means to help pay for a great education. As the commercial says, There are over 400,000 NCAA student athletes and most of us will go pro in something other than sports. That statement drives home why your choice of academic programs, school location and even social life should play a significant role in your college selection process. Are you the best player on the team? Are you the best player in your league or in a tournament? Are you one of the five best players in your position in the region / state? If you can't answer yes to each question, you probably wont play in front of an NCAA Division I crowd. But, thats OK! A good athlete can still play college sports. Division II schools can offer great academic and athletic scholarship opportunities. With the largest collection of NCAA institutions, Division III schools pride themselves on placing a greater emphasis on academics and can offer student athletes significant financial aid packages (even though they are not technically athletic scholarships). On average, Division III schools offer scholarship packages worth more than Division I or Division II schools. Over 290 schools belong to the National Association of Intercollegiate Athletics (NAIA) and can offer exceptional academic programs with full athletic scholarship opportunities. Consider everything when putting together a list of colleges and/or deciding which colleges to contact. Academic programs, size, location, campus environment, co-curricular opportunities, and special programs are among the factors you need to evaluate. Be realistic about the colleges and universities you target. Ask your coach to advise you about the level at which you can compete in athletics and your counselor to help you select colleges and universities which will be a good academic fit for you. Don’t count on athletic scholarships alone. Explore other sources of financial aid as well. Unlike coaches, Admissions Offices are allowed to contact and speak with you at any time, and will provide you with information you may not get from coaches. Do not rule out colleges initially on the basis of their published costs. Your actual cost may be much less. Your personal MVP Recruiting Coach can help you navigate all the options and help you come up with a list of target schools that match your individual interests and requirements. Why should I register with MVP? College coaches do their recruiting online, so it’s imperative for anyone who wants to play college sports to have an online profile. Register Now to build your FREE MVP profile and have access to a network of over 40,000 college coaches. Your MVP online profile is your athletic and academic resume that includes all of the information needed for college coaches to find, evaluate and recruit you. The more relevant information you post, the better your chances of getting recruited. Your MVP profile can contain sport-specific stats, pictures, videos, coach recommendations, athletic and academic achievements, academic goals and more. If you are a student-athlete who is serious about playing at the next level, but are not being heavily recruited at the schools where you want to play, you need to promote yourself to college coaches. Once you have completed (or updated) your athletic profile, you will want to make sure the coaches and scouts at all of your target schools see it. MVP lets you indicate your schools of interest and has numerous promotional campaigns that will get a coach's attention, make it easy for them to see your online profile and evaluate you. You are notified when coaches access your profile, watch your videos or indicate an interest in you. Registered college coaches have access to your personal information and can easily follow-up with you to begin the recruiting process. When can I contact a coach? Athletes and parents will want to familiarize themselves with the NCAA Recruiting Calendar to ensure compliance. While college coaches are prohibited from initiating contact with recruits during certain times of the year, a prospective student-athlete can reach out to coaches at ANY TIME. As long as you initiate the contact (mail, email or phone) a college coach can speak with you. This little known fact enables savvy student-athletes to get the jump on the recruiting process and could help you get a scholarship over other qualified athletes. What should I write in my email to a college coach? Keep it short and simple. Coaches appreciate it when you respect their time and get to the point quickly. Include your complete name, mailing address, phone, email, high school name and city/state, graduation year, academic interests (prospective fields of study), your position or events, experience, coach's name, phone and email. MVP's email guides and templates make this process easy. Create your own email form once and our system auto-fills in all the relevant information before sending your custom emails out to all the coaches on your target school list. And, because coaches are far more likely to open an email from an athlete vs a parent or company, emails can be sent from your personal email address. Believe it or not, some coaches are old school and are not comfortable with email. Technical difficulties can also prevent emails from reaching their intended recipients. Many coaches hear from hundreds or even thousands of students each year who are looking for athletic scholarships and/or an opportunity to compete in intercollegiate athletics. As a result, it is important that you communicate effectively with coaches, and understand that it may take some time before you receive a response from them. Be patient, but persistent. If you have not heard from a coach you contacted within a month, try again. If you do not receive a response to your second or third email, do not be discouraged. Depending on the season, coaches can be busy with their programs and may take a while to respond. There is certainly no problem continuing to send monthly emails. You should consider changing up the email content every few months to indicate status updates, newly posted videos, etc. You might also try alternative promotional methods such as MVP Recruiting Cards or Prospect Guides designed to grab a coach's attention. Be aware that a few form letters from a coach, brochures or invitations to a coach's summer camp does not always mean he or she is seriously interested in you. Realize that coaches make extra money holding their summer camps and undoubtedly want to fill them. Coaches can send hundreds if not thousands of invitations to complete prospect questionnaires each year. Some communication does not indicate a coach's sincere interest. However, if a coach sends you a personal email, calls or asks your high school or club coach for additional information or video, chances are there is a decent interest in you. Keep your options open and communicate with all coaches who show interest until you have a firm commitment. Your personal MVP Recruiting Coach is here to help you every step of the way. When you do commit to a college or university, contact and thank the coaches who have been communicating with you. This is a common courtesy, and may give you more options if you ever wish to transfer from the college or university you attend initially. Do I really need a highlight video? ABSOLUTELY! - VIDEO IS YOUR MOST IMPORTANT RECRUITMENT TOOL! As we like to say, "If you are not Visible to college coaches, YOU ARE INVISIBLE". Due to limited recruiting budgets, videos are the first thing college coaches look for when scouting student athletes – and it is one of the first steps you should take when creating your athletic profile. Remember, you created your profile to promote your abilities to college coaches across the country. The easier you make it for coaches to see and evaluate your abilities, the better your chances are of being recruited. If you don't have a great video highlight package, MVP has professional HD crews that can film your games. Our professional editing crews can use that video, your own game film or schools HUDL video to produce highlight videos uniquely tailored to showcase your skills and impress college coaches. Visit our MVP-TV page or MVP YouTube channel. for some sample highlight videos. How do I get recruited at a large Division I school? The recruiting process for major colleges is usually more advanced than smaller schools. NCAA Division I schools typically have larger recruiting budgets and work with scouts around the country to locate, evaluate and recruit the best talent. If you are a legitimate D1 athlete, but are not on the major college coach's radar, you will need to act quickly to promote yourself through email, regular mail, scouting reports, prospect guides, professional video and other creative means. If one communication method fails, don't give up. Coaches take notice of athletes who are persistent and show a genuine interest in their programs. How do I get recruited at a smaller school? Smaller NCAA Division I, NCAA Division II, NCAA Division III and NAIA schools have limited recruiting budgets. They typically do not recruit beyond a one or two-hundred mile radius of their schools. Therefore, a small school in Arizona is not likely to find or recruit players from Florida, Ohio or Texas. Instead, these programs rely on interested and qualified athletes to seek them out and make the effort to be evaluated by their staff. If a good player from a distant state was to show a strong interest in a particular school, the chances of getting noticed and recruited go from nil to good. Of course, this means you will need to put together a strong resume including video package and proactively promote yourself. Keep in mind that these coaches still need to evaluate you, so good highlight videos, attending their camps and/or visiting the school is always a good idea. Sometimes coaches can help out financially with visits or camps but typically an athlete will need to share some of the expense. As always, your personal MVP Recruiting Coach can help develop a custom program to meet your specific needs. Can I get an athletic scholarship at a Junior College? If you are planning on going to a community college and playing on a junior college sports team, you could be eligible for funding from the National Junior College Athletic Association (NJCAA), which awards full and partial scholarships, or grant-in-aid awards, to talented athletes at its 525 member colleges. The NJCAA sponsors the following sports: fall and spring baseball, basketball, bowling, cross country, football, fall and spring golf, ice hockey, indoor and outdoor track and field, spring and fall lacrosse, fall and spring softball, fall and spring soccer, swimming and diving, fall and spring tennis, fall and spring volleyball, and wrestling. Eligibility requirements may vary by school, so for more information about obtaining an athletic scholarship through the NJCAA at a specific community college, you will need to contact the athletic department at the school you are interested in attending. The general requirements for prospective NJCAA student-athletes are the following: Students must be a high school graduate, have received a high school equivalency diploma, or have been certified as having passed a national test, such as the General Education Development Test (GED). Non-high school graduates can establish eligibility by completing one term of college work and passing 12 credits with a 1.75 GPA or higher. Students are allowed two seasons of competition in any sport at a NJCAA college, and must be full-time students while they are playing those sports. Remember that the NCAA isn't your only option if you're a student-athlete. And if you do transfer to an NCAA college after two years of playing at a community college, the GPA and standardized test score requirements are different than on the NJCAA level. For more information about opportunities from the NJCAA, visit www.NJCAA.org. How can I Tell Coaches About My Recent Accomplishments? You should always keep your profile updated with recent videos, pictures, stats, accomplishments and news articles. The best way to inform college coaches about how well you are playing is through your custom email campaign each month. You can add the information to your email for that month and we will automatically send it out to your select list of coaches. If you have specific questions we did not address, or suggestions for improvements to our site or programs please contact us today! MVP is FREE for college coaches and is a great way to find and evaluate athletes, watch their videos, see coach recommendations, view biographies, current statistics, featured articles, academic and personal information. 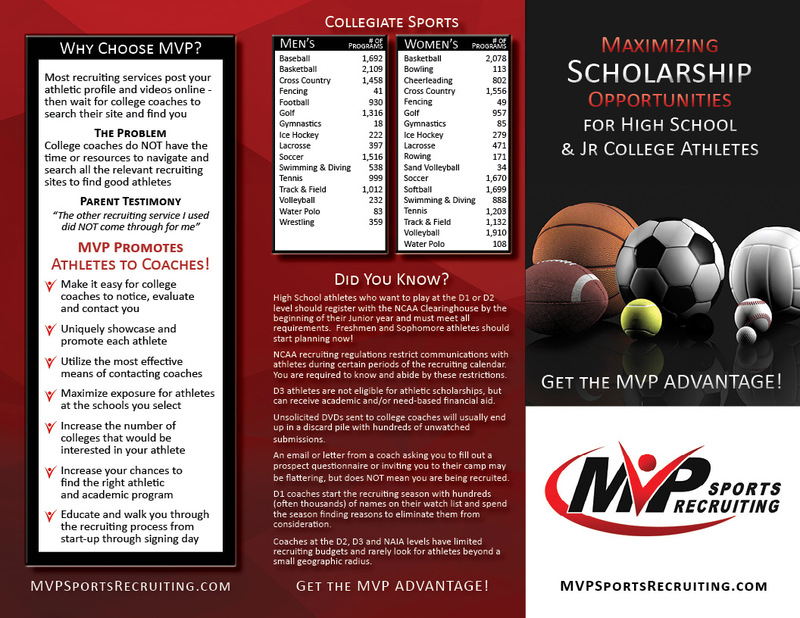 MVP recruiting tools break budgetary and geographical boundaries and allow you to track athletes, indicate interest levels, contact athletes and even locate non-MVP athletes by posting requests to our entire network of college, club and high school coaches. To locate the profile of a specific athlete, simply login to your account, click the Search tab and type in the MVPID# or Name of the athlete. To search for athletes that meet certain criteria (such as graduation year or position), simply enter the qualifications of the athlete you are looking for. MVP profiles include detailed information for each athlete with videos, statistics, photos, articles, academic information, accomplishments and more. You can save athletes to your favorites list and keep up with their progress throughout the season. What if I can't find an athlete that meets my needs? 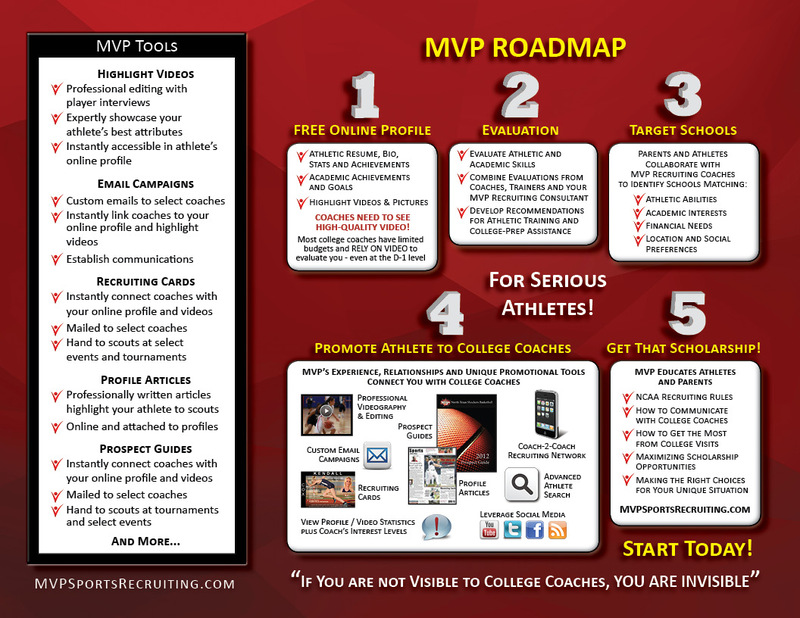 MVP Coach-2-Coach allows you to post messages to our network of registered High School, Club and College Coaches. Need a power-hitting, right-handed 3rd baseman? Send your request to the coach network and fill that need even if it is not with a registered MVP athlete! How do I keep track of MVP athletes? Once you find an MVP athlete you are interested in, you can let them know by indicating your interest level on their profile. You can also track promising recruits as favorites and even add notes to their online profile that only you can see. How do I contact MVP athletes? Registered coaches have access to the personal contact information for MVP athletes. You are free to write, email or call them (consistent with your governing recruiting rules). You may also contact the athlete's coaches or MVP Recruiting Consultant at any time for more information. If you have specific questions we did not address, or suggestions for improvements to our site or programs, please contact us today!